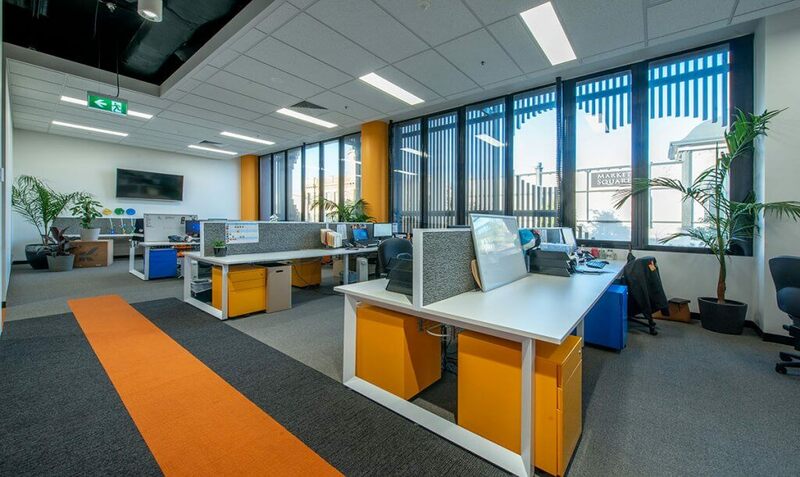 Merit Interiors specialise in future-proofing today’s workspaces for tomorrow’s opportunities. 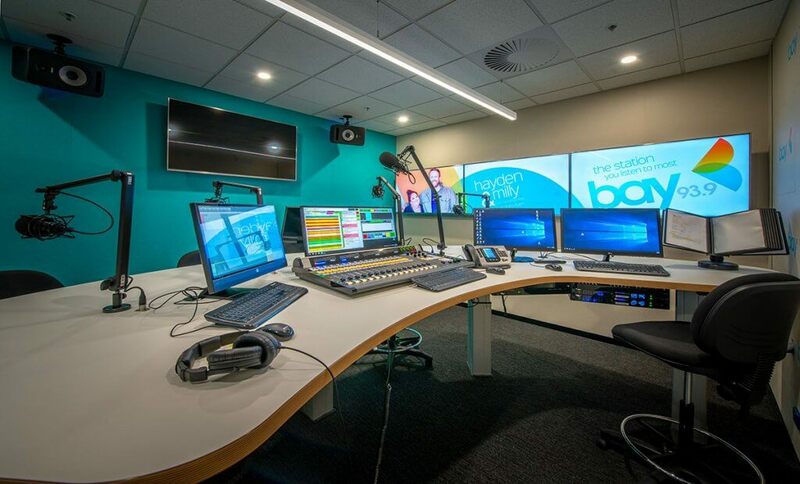 Adaptable and agile, we’ve been involved in many transformative interior design projects – including the design and fitout of Grant Broadcasters’ new state-of-the-art studios for its K-Rock and Bay FM radio stations. We faced and overcame a number of challenges during the project, from accommodating more staff to delivering larger studios with very specific acoustic requirements. The number of staff to be accommodated on the new floor plan was almost double the existing capacity for the 1200sqm space. The floor plan also needed to house four radio broadcasting studios with news booths and a news support area, as well as the production and voice studios. All of which – larger than the existing studios. The final layout would need to facilitate the high acoustic requirements of the studios while also allowing clear lines of communication and the flow of natural light across the floor plate. We met each challenge in our design solution. Given the increased space requirement and the existing floor area of 1200sqm, the design team proposed a central internal spine, connecting the main broadcasting studios, news booths and news support areas with the four studios. This would provide an avenue for the two radio stations to share resources. The open-plan office was then planned around the central spine, framing the broadcasting studios and positioning them as the feature of the floor plan. The circulation between the spine and the open-plan office was not only practical but provided constant visual access into the radio studios – maximizing transparency within the space in its totality. 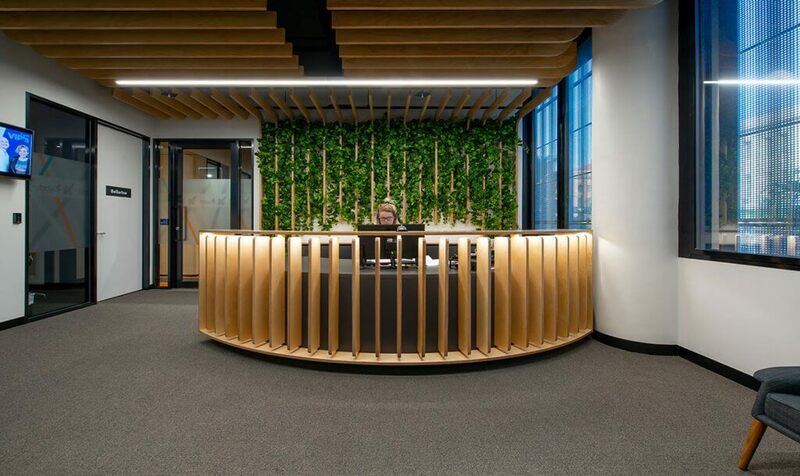 Through the central spine, we also created a connection between the L-shaped staff break-out space and the two offices – providing a seamless junction between areas and natural flow within the workplace. Positioning the desk areas along the façade line allowed maximum natural daylight to penetrate deep into the floor plate. Strategic arrangements of storage and perforated screens created a sense of openness and privacy for staff to enjoy their work, and thrive. 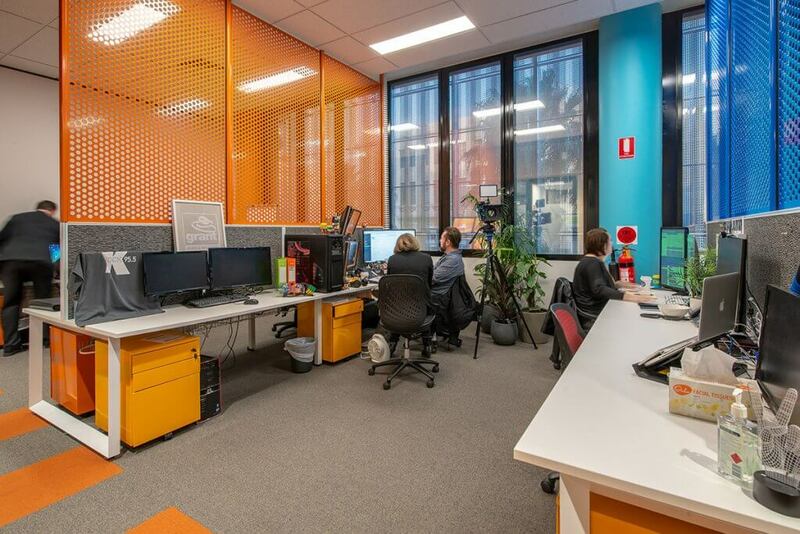 The new layout has provided Grant Broadcasters with an incredible space to accommodate up to 65 staff with the flexibility to expand and adapt to their future workforce requirements. The team now enjoys double their previous broadcasting and production space and overall, a more human-centric workplace. The radio studios have become the ‘heart’ of the fitout – now centrally located with improved transparency and visual accessibility. 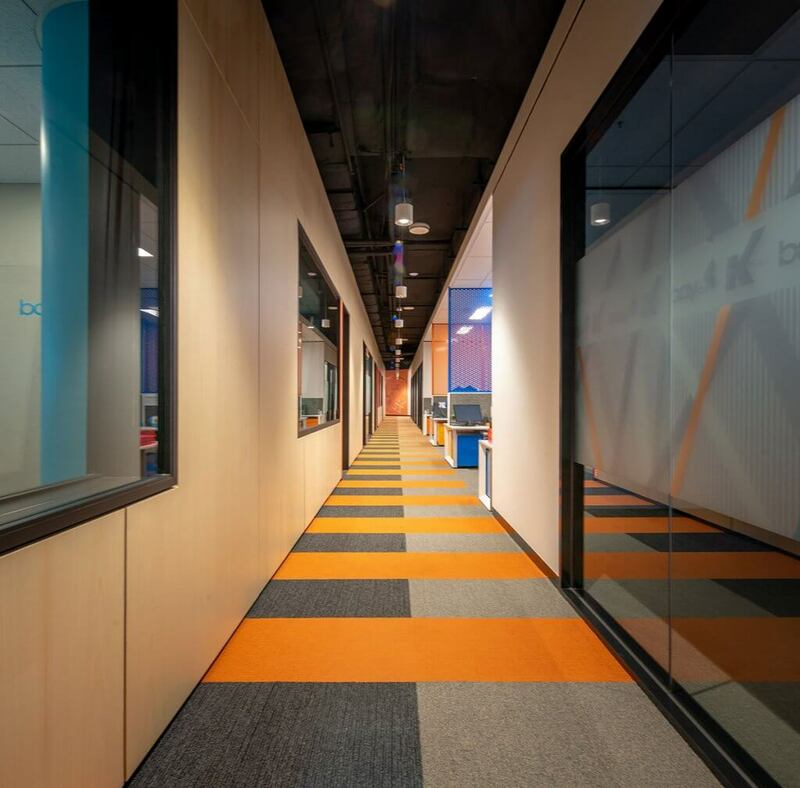 Bold colours and floor patterns work with the exposed ceilings to heighten the experience of moving through the space – providing a strong connection between the open work environments and the studio spine. The main staff break-out area arrives as a place of relaxation from the activity of the surrounding desk and studio zones. 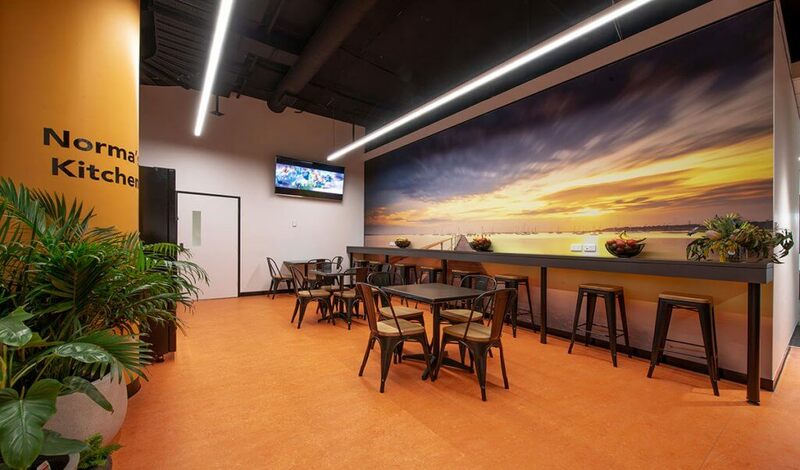 The dark kitchen, exposed ceiling, and large wall photography welcome staff into a space designed to nurture, inspire, and reflect the positive culture that Grant Broadcasters cultivates in the workplace.